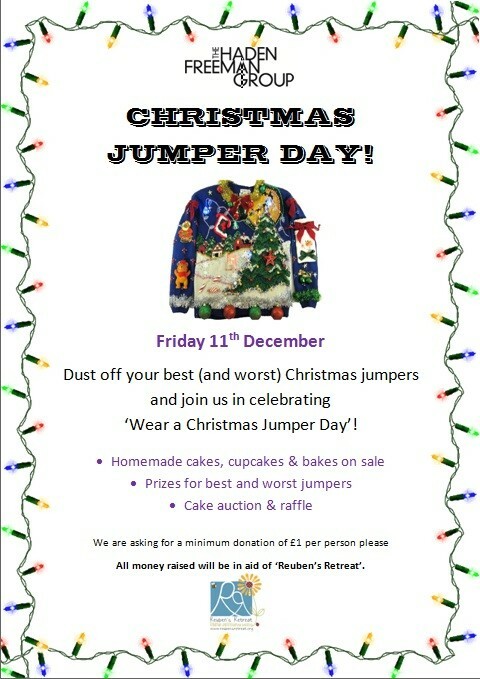 The Haden Freeman Group has organised a ‘Wear a Christmas Jumper Day’ in aid of local charity, Reuben’s Retreat. The day is being organised by Haden Freeman’s Marketing Assistant, Jennifer Yates and PA to the Executive, Deb O’Connor. Staff members will be providing homemade cakes, cupcakes and bakes to be sold on the day, and a raffle will also take place. Prizes for best and worst Christmas jumpers will be awarded. The Haden Freeman Group is proud to support this wonderful local charity and wish them every success in the future. To find out more about Reuben’s Retreat, or to make a donation, please click here.